I've been working on this before the lingerie-project, but only finished it after that. 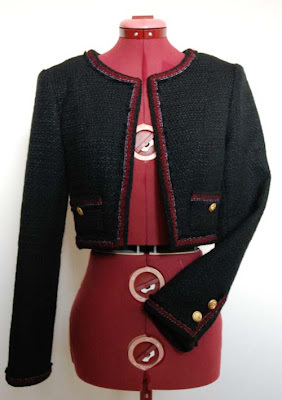 My (rather un-authentic) version of a Chanel-jacket. I think these things can often be a bit dowdy, but between seeing cool versions on catwalks and in fashion magazines for the past two winters, watching 'Coco avant Chanel' and coming across and lurking around this blog the look started to grow on me. I just had to give it a try. And I still had about 4 meters of this wool/polyesther/viscose boucle sitting in my stash without a clear plan what to make of it. So a Chanel jacket it had to be. I borrowed Claire Schafer's 'Couture sewing techniques' from the library, but far from followed all the instructions of Chanel jackets. This fabric just isn't worth it. I drafted my own pattern, as usual. It's a simple fitted shell, cropped to waist length (to make it look a bit younger). I changed the shoulderline a little bit to allow for small shoulder pads. It has two-piece sleeves with buttoned vents (normal jacket-style vents, not the official Chanel-style fully functional ones). It is lined normally (no quilting), the pockets are lined and sewn on by hand, once I find the needed supplies, it will have a hooks-and-eyes closure, the trim was made from the fabric selvedge and sewn on by hand and those golden coloured buttons are sailor-style buttons from my grandmother's button stash. I think I'll be going on to make more summery stuff from now on. Spring has finally, and rather suddenly, hit the Netherlands this week and all I can think about are big skirts made of light cotton, new trouser shapes in lighter fabric, inventively shaped t-shirts and all kinds of summery dresses. And that bathing suit of course. and sewing for other people. I may even put the vague spring-coat plan I had back on the shelf. I may make a post tomorrow about the things I definately want to make from fabrics I already have, just to keep myself on track. In that post, I'll also try to answer a couple of questions which have come up in the comments lately. That's a lovely jacket. The trim looks great! Nice sewing! Love the jacket (and the lingerie from the previous post). insteadi, you can email me at aicha_hockxAThotmailDOTcom (replace capitals by the appropriate symbols). I may have some advice about buying a dressmaker's dummy, but not a clear-cut solution. Lauriana, you are a bloody genius! Thanks so much for your advice regarding my top. I never thought that the sides would be open, which totally makes sense! I also agree that the bow has a separate closure and the side things are part of the back... but the opening at the sides is what I couldn't get my head around! A trillion thank-yous! I'm desperate to start it THIS INSTANT, however we're in the middle of a blackout :( I've had to go to my mum's house because it's so boring with no electricity! Oh, and that Chanel jacket is ridiculously spectacular. I think it's totally convincing. If you told me that was the real deal I'd definitely believe you. This jacket is totally stunning, and looks immaculately finished, as all your garments are!